My hand snakes out again almost against my will, grabs a traffic-light red strawberry from its stem and I pop it into my mouth. I’m actually supposed to be putting it in the plastic punnet I’m carrying but it’s impossible to resist the sun-warmed fruit. 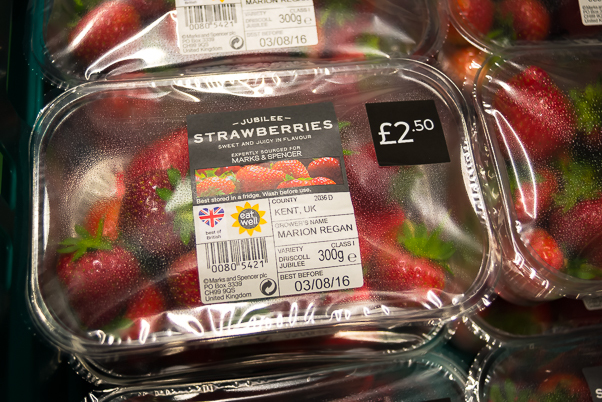 This variety, called Jubilee and bred for local conditions, is particularly fine, it’s naturally sweet (no need for sugar on these) and with a fine acidity on the finish that makes it really a gourmet strawb. 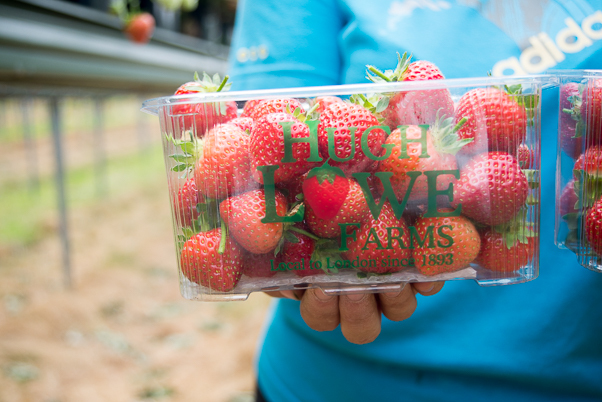 ‘Very good with a twist of black pepper, too,’ says Marion Regan who’s out here with me, she’s the Managing Director of 120 year old Hugh Lowe Farms, the great-granddaughter of the founder and her great-grandfather planted the first crop of strawberries. We’re strolling under her plastic growing tunnels that seem to stretch out forever. They’re open-ended and a gentle breeze is running through but it’s still warm on this perfect summer’s day in the Garden of England. Although it’s barely 11am the real picking has mostly finished for the day; it started at around 4am when it was cool because the strawberries need to be picked, packed and on their way to London as soon as possible so that the supermarket shoppers can enjoy them at their very best. The old strawberry fields that I remember always had the plants on the ground, which must have been hard work on the pickers’ backs. 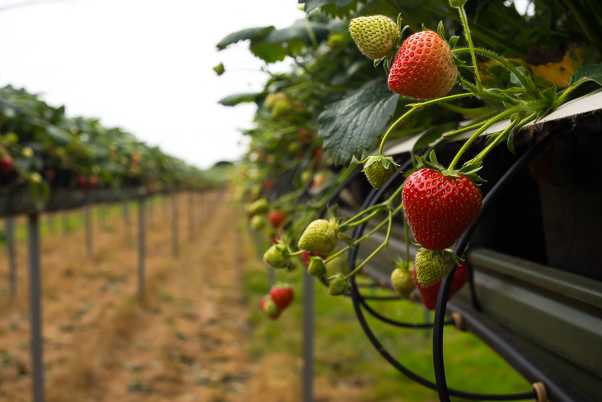 Today though they are grown ‘table-top’ at around waist-height so that the pickers can easily move down the rows and the plants are away from bugs and mice. Talking to one of the pickers, who hasn’t yet left for home, I find out there’s an art to the picking. With around six punnets on the trolley that’s she’s pushing ahead of her she needs to select by ruby red colour, scent and similar size, as well as ripeness and the ideal heart shape. Each one must be perfect and, she tells me, they must each have one centimeter of stem attached. Any pulled off without stem are discarded along with the ugly ones and end up as compost. All are gently placed in the collection punnets to avoid bruising, because any damaged ones will be rejected at the packhouse and the system will always know which picker had the heavy hand. This is an ultra-modern operation. 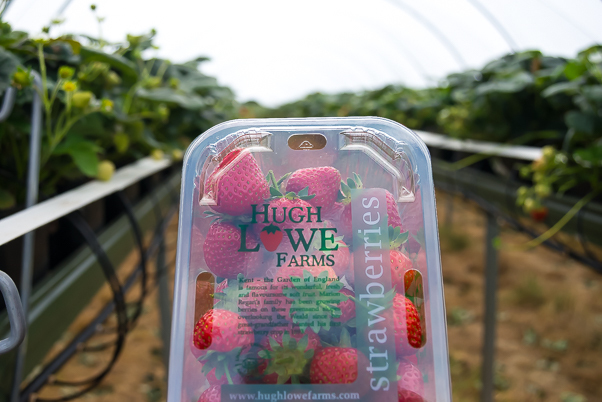 Hugh Lowe Farms produce around 40 million strawberries each year, all of which are handpicked, so it’s a massive operation too. 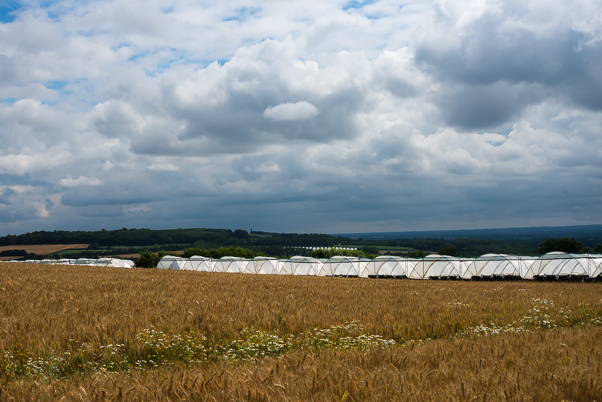 The farms are committed to environmental responsibility; the tunnel roofs catch rainwater which is stored to use on the crops, and they follow a Whole Farm Environmental Plan, which covers conservation, waste management, water management, recycling, energy efficiency and crop protection policies. Inside the tunnels they experiment with planting wildflowers to encourage the all-important pollinating insects and use natural predators to keep the bad insects at bay. 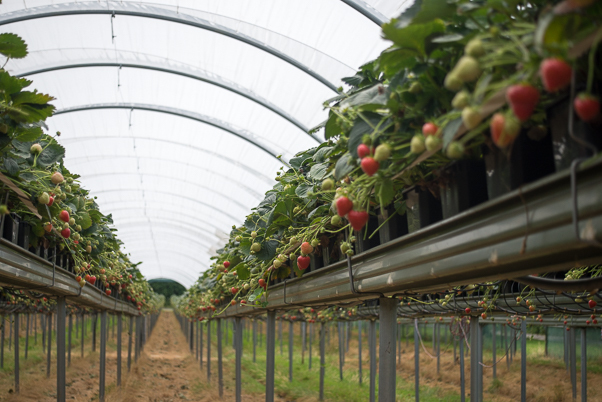 The low tunnels themselves maximise the sun’s energy and minimise the need for other energy use, they make no lasting impact on the soil and are low and inconspicuous from a distance. We go to the pack house where the strawberries arrive constantly from the fields to be taken straight into refrigerated production rooms where they are sorted, weighed and put into their packaging ready to hit the motorway. 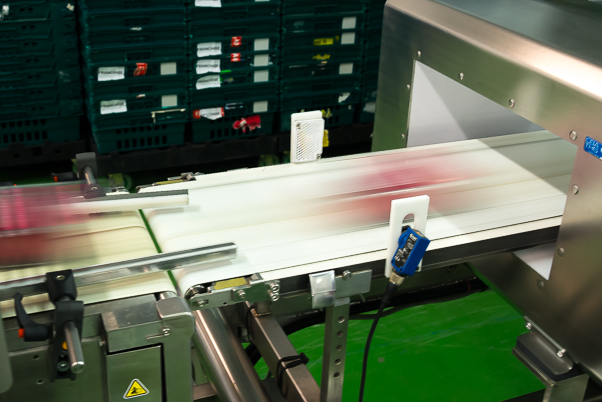 It’s a high tech environment designed to maintain freshness and keep the strawberries constantly on the move. 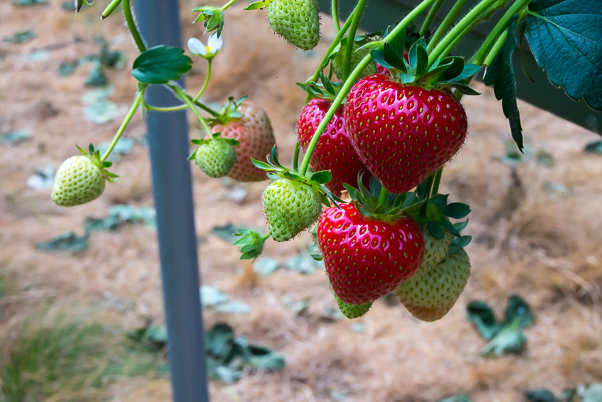 I didn’t know that strawberry varieties are actually divided into short-day types (Junebearers) and day-neutral types (Everbearers) and I think, like many people, I rather assumed strawberries were out of season after June and Wimbledon, the quintessential strawberry eating date. In fact everbearers will fruit until September and we can enjoy them all summer long. I left with a punnet of my own picked Jubilees and fought the temptation to eat them all on the train journey home, I wanted the family to also experience what a real strawberry tastes and feels like. To try something that wasn’t one one of those apple-hard, semi-green, usually under-ripe tasteless monstrosities passed off as a proper strawberry. I got home with half of them left. Available from May to the end of September in the premium ranges of Britain’s major supermarkets; Sainsbury’s Taste The Difference, Tesco Finest, Marks & Spencer Top Tier, Asda’s Extra Special and Waitrose Specialty ranges. This entry was tagged culinary tourism, Food, nick harman, strawberries. Bookmark the permalink.